Our core values support the mission of our ministry and tell us how, or in what manner, to work to achieve our mission. Core values act like filters that guide our decisions and behaviors, and state what is important to our children’s ministry teams as we do ministry. We value partnering with parents and guardians to connect their child to a closer walk with Christ. We value that all children are different, so we emphasize diversity in learning and living. We value that God’s timing is perfect and this ministry is His fun. We value the arts and active learning when teaching truth. We value building relationships that matter with kids and adults. We value a safe, kid-friendly environment. We value children as God’s very own, and believe that He uses them now. Tiny Town is a ministry experience for kids up to 2 years of age. Tiny Town is open during both the 8:30 and 11:00 services. The Tree House ministers to kids from ages 3 years- 1st grade. The Tree House is open during both the 8:30 and 11:00 services. The Warehouse ministers to kids from 2nd grade through 5th grade. We offer the Warehouse ministry on Sunday mornings at 11:00AM. On the last Sunday of each month, our Warehouse Kids get to attend "big church" with their families. If you have questions about our Sunday morning ministries or want to serv in this ministry, contact Rickey Hall at 502-598-6932. CLICK HERE for our full Spring 2018 schedule! 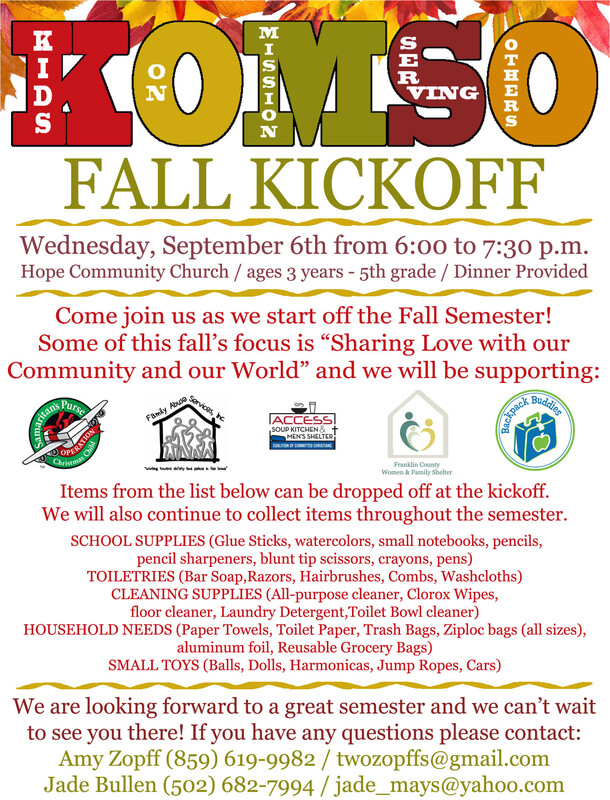 KOMSO, or Kids On Mission Serving Others, is a ministry experience for kids from three years old through 5th grade. KOMSO meets on Wednesday nights during the Spring semester. Three year old -1st grade meet from 6:00-7:30PM. 2nd through 5th graders meet from 6:00-7:30PM. One of the best ways for you to keep up with everything that is happening with Kidzway Children's Ministry is through our social media pages. Click, like, or follow us today to find out what's happening this week and how you can join in!